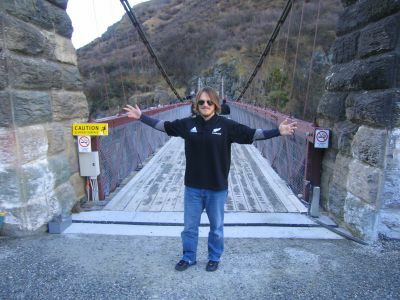 in queenstown standing at the end of the kawarau bridge, the site of the world's first commercial bungy jump, wondering what i have gotten myself into. 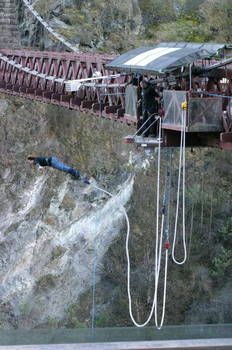 3 bungy jumps? in one day? i hate myself for the decisions i make sometimes. just before launch and the guy's having me pose for pictures. 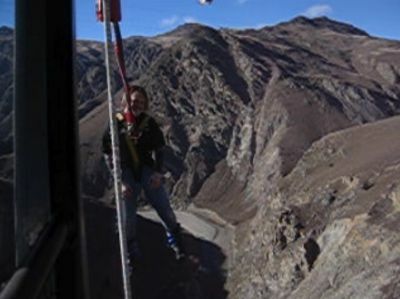 i'm wondering if the towel wrapped around my legs is going to save my life once i leap off the edge while he's wondering why i'm not smiling. how often do you get to quote david lee roth? "i might as well jump, JUMP! go ahead and jump, JUMP!" i listened to van halen all morning to psyche myself up. i mean really though, what else are you going to do when you are up there? hesitating doesn't help - it only makes it worse. immediately after they caught me in the boat that floated in the river below, i jumped on a bus and they drove me up a winding, climbing, narrow dirt road to the edge of a canyon where this, the nevis, awaited. 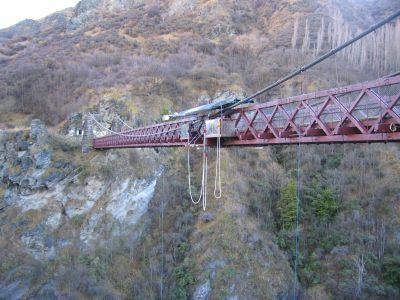 this thing dangles 134 meters (442 feet) above the canyon floor, the second highest bungy jump in the world. you have to ride a little cart out to it. all i wanted to do was go home when i saw it. i think i actually whimpered right before taking this picture. what kind of TWISTED, RAVING LUNATIC AM I?!?!?!? i am actually PAYING TO DO THIS?!?!? 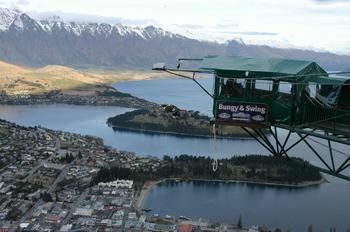 yep, i slapped down $299 (kiwi) for 3 jumps and a t-shirt. strapped in with my toes hanging over the tiny metal launch pad. i was so scared i had to just go. the countdown began...THREE! i am absolutely not making this up: the metallica song "damage inc." was blasting over the stereo as i waited to launch and just at the exact moment i leapt, james hetfield sang: "DYING TIME IS HERE!" 100% true. 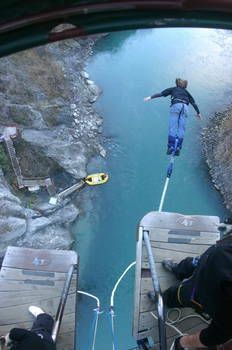 i had this in mind as i rapidly sped face-first towards the rocky river below. 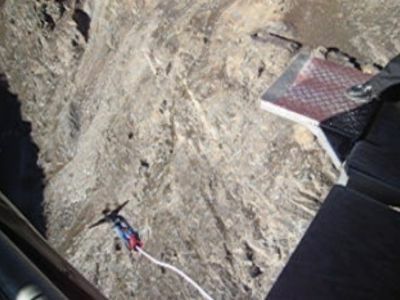 8 seconds of free-fall. i lived despite james's prophecy. the ride was incredible. as soon as you launch you simply enjoy yourself, no thoughts at all of the thing not working. it's going to work. the sign above the door as you walk out to the launching pad says "the first meter is the hardest." definitely. 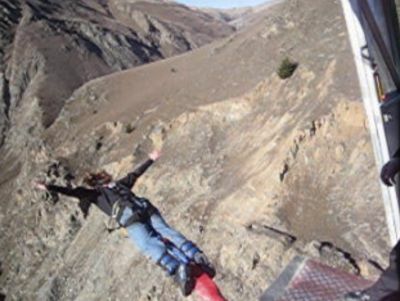 getting yourself to jump off is the hardest part - after that it's all fun. muchas gracias to mary for the amazing video she took of my launch. 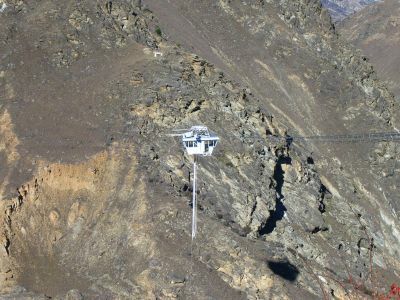 all the photos here of the nevis are lifted from her video. 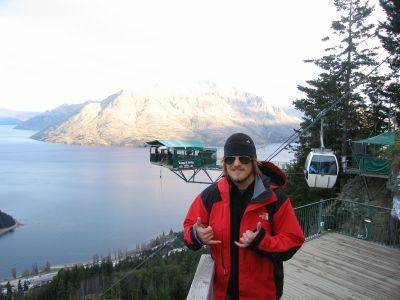 i took a few hours break, during which i figured out what i am going to do when i return home, and then made my way up to the ledge bungy at the top of the gondola on queenstown hill, 400 meters above the town. 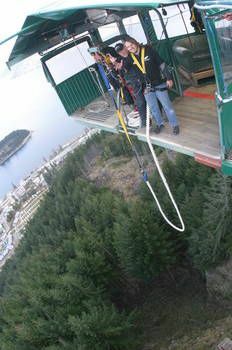 here i am about to jump. i was excited to have this day over and done with. 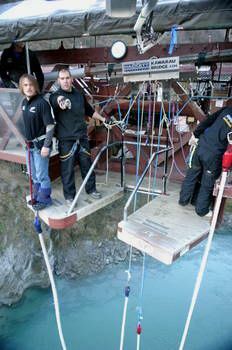 bungy is totally amazing but you feel glad when it's over, so happy to still be alive. 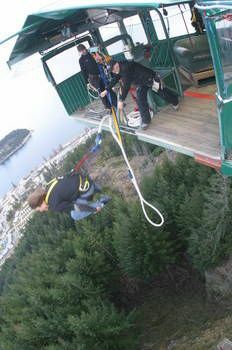 i think all the adrenaline in my system was spent at this point. i had more confidence having already done two bungys that day so i attempted a trick. this is called a squirrel or a bomb. i fucked it up but it was still a lot of fun. sorta hard to see me but i am that small hunk of meat in the middle. wow. thrillogy done. let's get off this mountain and go have a victory beer!